Regular readers of this blog or subscribers to it will be aware that occasionally we offer Wildlife Training Courses on a range of subjects to local aspiring naturalists who take an interest in the Humberhead Levels. The Executive are please to announce that Prof Mark Seaward is to provide “An Introduction to Lichens” on Friday 29 March 2019. Booking is essential to secure a place. Please book early to avoid disappointment. The course is aimed at people with an interest in natural history and keen to get to make a start in the identification of Lichens. The workshop aims to provide students with an introduction to the fascinating world of lichens, through a series of talks, discussions and practical field work. It is possible to attend just the morning talk if preferred. The field trip will be local to the venue and will take in variety of substrates where assemblages of lichens can be found. Students should wear stout footwear and bring a hand lens if they possess one, if not some will be available to borrow on the day. Refreshments and lunch are provided. A contribution of £10 towards costs of room hire, refreshments and lunch is requested. Any student(s) in full time education are advised to make this known when contacting and booking a place. Likewise anyone with any special dietary issue is likewise advised to make this known when booking. Please contact execsec@thmcf.org for more information and to book a place. Forum publications will be available, including special offers. Prof Seaward is also bringing natural history books for sale with the proceeds going towards his God’s Acre Project. Just back from the printers is the latest edition of the Thorne & Hatfield Moors Papers. Volume 11 is 178 pages plus a further 20 of content details etc. Liberally interspersed with colour photographs, maps and diagrams to accompany some 16 main papers. To make the information within the volume widely available the Executive are offering it at just £7 plus postage & packaging at cost £2.95 (second class) so a total of £9.95. Copies can be obtained from T&HMC Forum Publication Sales, PO Box 879, Thorne, Doncaster, DN8 55WU. Please make cheques payable to T&HMC Forum. Alternatively copies are available locally from the Thorne Times office. Mick Oliver, Colin Howes & Louise Hill: Lindholme Old Moor. A refugium in a severely damaged landscape. Mick Oliver: Lindholme: an outline history. Paul Buckland: The Nature of Lindholme. Louise Hill: Vegetation mapping on Jack’s Piece, Lindholme Old Moor. Colin Wall: Some observations on the Bryophytes of Lindholme Old Moor. Tim Prosser: Using Lidar data to map Lindholme Old Moor. Colin Howes & Derek Allen: The Lindholme Oaks. David Williamson: The moths of Lindholme: the Doncaster Naturalists’ Society experience 2013-2017. Colin Howes: On the Vapourer trail: records of a relict Scarce Vapourer Moth population on Lindholme and adjacent parts of Hatfield Moors. Colin Howes & Pip Seccombe: Beewolf at Lindholme: notes on a population of Philanthus triangulum (F.) (Hymenoptera: Crabonidae) at Lindholme, Hatfield Moors. 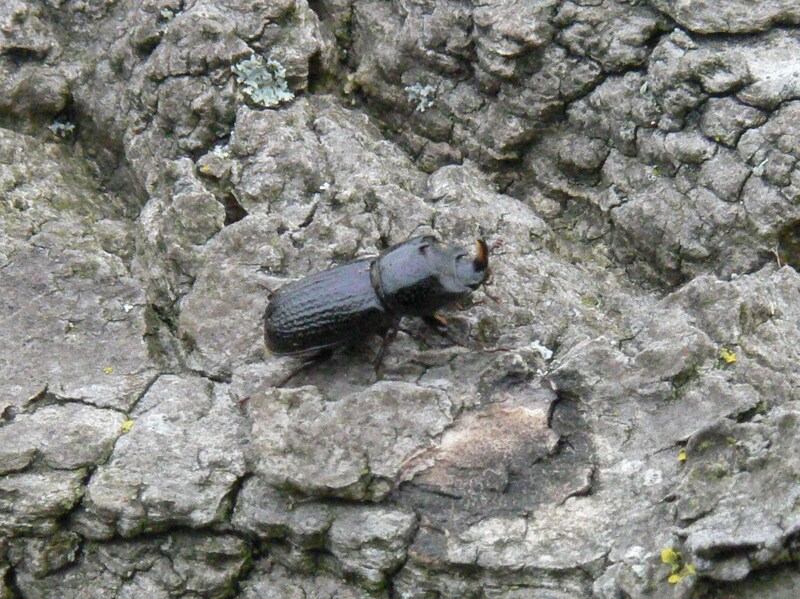 J. Hobart: Is the Minotaur Beetle (Typhaeus typhoeus (L.)) more common at Hatfield Moors than previously thought? Colin Howes: A Note on the Otter Lutra lutra at Lindholme Lake and the Hatfield Moors Drains. Colin Howes: A historical review of bat records from Lindholme Old Moor and adjacent areas. Colin Howes: Hatfield Moors, an oasis in a sandy desert: the effects of Drift geology, soil type and landscape on air moisture at RAF Lindholme and RAF Finningley. Posted in Executive Secretary | Comments Off on Humberhead Levels; handkerchief sites and natural history gems? There’s nothing like a day in the field to recharge batteries. After the last couple of weeks of political pantomime, or would it be better described as a farce, fresh air, a pleasant landscape and stunning wildlife were a refreshing change. This stunning male Banded Demoiselle was just one of perhaps forty or so of the species present along a relatively short stretch of the River Idle. No sooner had you got your camera focused on them than they flew off just a short tantelising distance away. 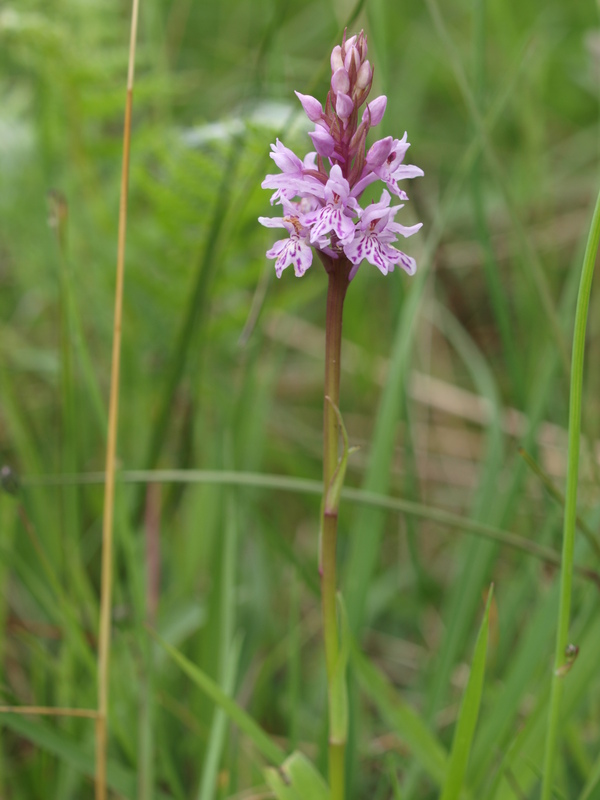 This species is reasonably common in the Humberhead Levels where they can be found along clean water courses and a few remaining ‘hidden’ ponds where they have not been absorbed into the expanse of monoculture. I’ve even had one in my garden! The Humberhead Levels has a number of pocket handkerchief gems, sites where time seems to have stood still. These sites are few and far between and not always well known, they are often in private ownership which can be either a blessing (as in the case of Inkle Moor) or a curse. There are some farmers as opposed to agri-industrialists who turn a blind eye and let nature alone. The issue might then be if they change hands and the new land owner or next more business minded, profit orientated generation seeks return from investment. Perhaps with Brexit the review of agricultural subsidies, or agri-welfare payments call them what you like (ex CAP), we might see payments made to farmers who are able to evidence tangible public benefit from receipt of public funds? Drainage to benefit agricultural intensification can be detrimental to wildlife. We reported infill of a pond in the HHL recently, one where we understand there had been Great Crested Newts in the vicinity, likewise Water Voles. Both these species are protected by legislation. But, it seems that the public are now expected to provide evidence of presence rather than those with a duty? Note that there have been some changes to primary legislation around biodiversity duty. However, much still remains. Some species of ‘dragons and damsels’ are quite sensitive and have particular habitat requirements. Such species need land management practices which take account of ecological requirements. Where water courses are managed by the Environment Agency there seems to be a better understanding and a willingness to work with others to achieve biodiversity benefit. Local Internal Drainage Boards, despite being Public Bodies and in receipt of substantive public funds appear to have little knowledge or regard for relic populations in their districts. Biodiversity Action Plans seem to favour easy quick wins such as a few Barn Owl boxes along deep trapezoidal drains. How many have a biodiversity inventory for their catchment areas? How many undertake collaborative projects with third parties? Four Spot Chaser is another commonly encountered species in the right habitat. This and the Broad-bodied Chaser below are both recorded from Thorne Moors. Images courtesy of Martin Warne. Posted in Executive Secretary | Comments Off on Nature’s cure? Did you hear a ‘gabble ratchet’ on All Fool’s Day? Or a Goatsucker or Fern Owl perhaps? “Bog birds and bugs” was the title of a talk given by Lucy Ryan, a masters student at the University of York to an enthralled audience at the Annual Meeting of the Thorne & Hatfield Moors Conservation Forum held on 1 April 2016. 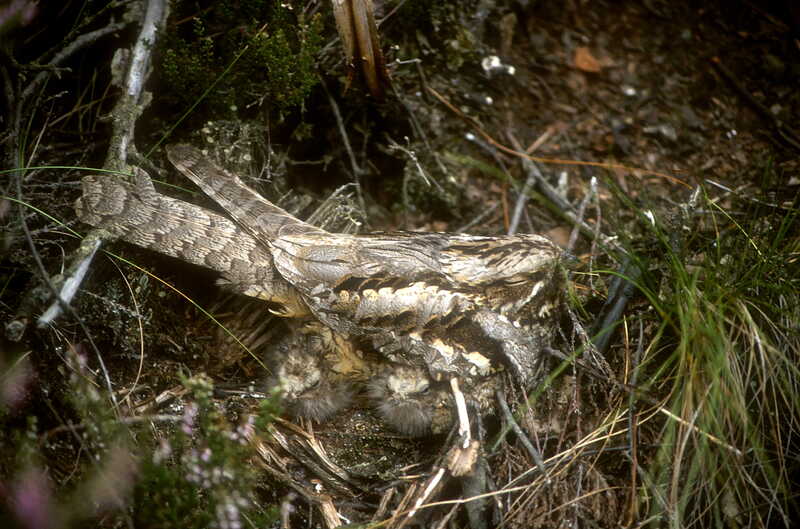 Lucy’s presentation which was supported by some superb images explained about the monitoring of the nightjar population on Thorne and Hatfield Moors. This study had a pilot year on Hatfield Moors in 2015, but this coming season will see the study scaled up and undertaken on both Thorne and Hatfield Moors. The three year study, funded for its first year by Natural England LIFE+ Project will look at the impact the management works undertaken by Natural England on the key species and interest feature of the European Natura 2000 Site. The Water Level Management Plan being implemented by Doncaster East Internal Drainage Board is not undertaking any monitoring of impact post implementation, instead handing responsibility to Natural England? These two major engineering projects costing in the region of £5.2m are currently being carried out on Thorne Moors are it is hoped will safeguard the site for its carbon sequestration capacity as well as its wildlife interest and as a natural wilderness for people to study and enjoy. A second talk “Who started the drainage? Iron Age & Roman Landscapes in the Humberhead Levels” was given by Dr Paul Buckland who offered options as to the man-made and natural influences upon our local landscape. With the aid of aerial photographs showing crop marks and more recent LIDAR images Dr Buckland took the audience through time to the present day and to a very different landscape to that historic wetland once present across the Humberhead Levels. After an excellent lunch provided by the Moorends Miners Welfare and Community Development Centre, intrepid explorers braved the dull weather and headed out along Broadbent Gate Moor, also known as Jones’ Cable to reach the tilting weir along the Southern Boundary Drain. As if on cue a Marsh Harrier flew overhead offering evidence of the wildlife interest of the site. The number of sightings of this species has increased over recent years and this Natural England attribute to the wetter conditions they are creating across the site. The cessation of industrial scale peat extraction at Thorne Moors also reduced disturbance for a period but increasing visitor numbers encouraged through Open Access has also seen new threats to rare breeding species and NE have had to close down parts of the site to protect them in recent years. To those who attended for the first time, after a series of great talks amidst great company about a great site …. see you again next year? Posted in Executive Secretary | Comments Off on Did you hear a ‘gabble ratchet’ on All Fool’s Day? Conservation matters? “No net loss”? Grey and grizzly might have been an apt description for today’s weather but not to be deterred I went to check out the aftermath of some local haymeadows. The pastoral landscape of the Humberhead Levels, in quiet secluded corners is like stepping back into the past. There are fragments, which because of the their inaccessibility to large machinery or their physical station amidst river courses and highways make their survival more likely. With the realisation of the decline in natural grasslands and haymeadows the last few have been acquired by conservation charities and are managed in keeping with the traditions which created them. 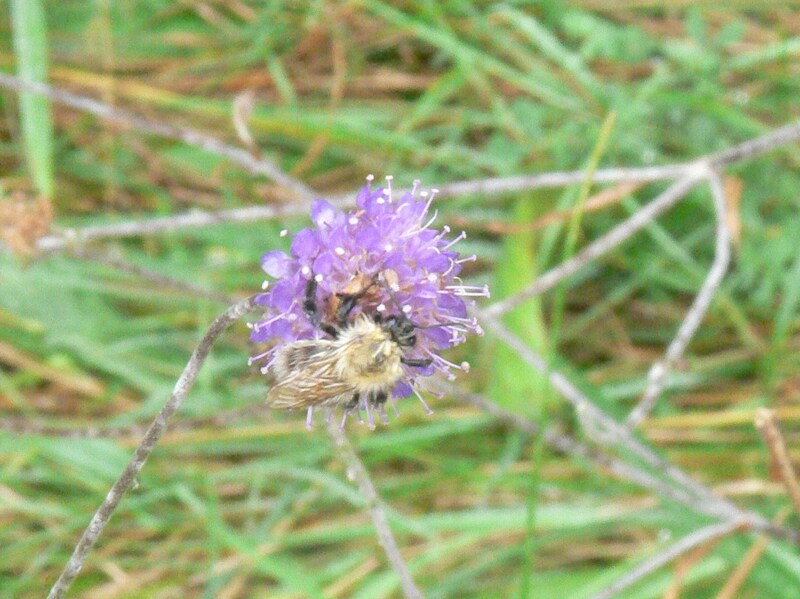 Despite the damp there were hoverflies and bees making the most of late nectar on offer. 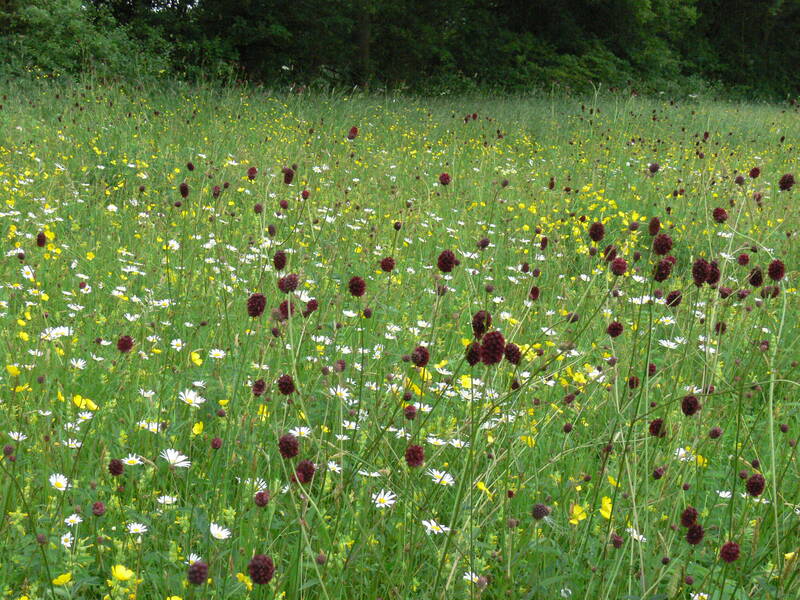 Knautia arvensis (above) is a plant of grasslands and meadows and a tail end charlie in terms of summer flowers. Interestingly where the reaper had left uncut there were a number of white speciemns and a single pink bloom. EU consultation on biodiversity: ‘No net loss’. 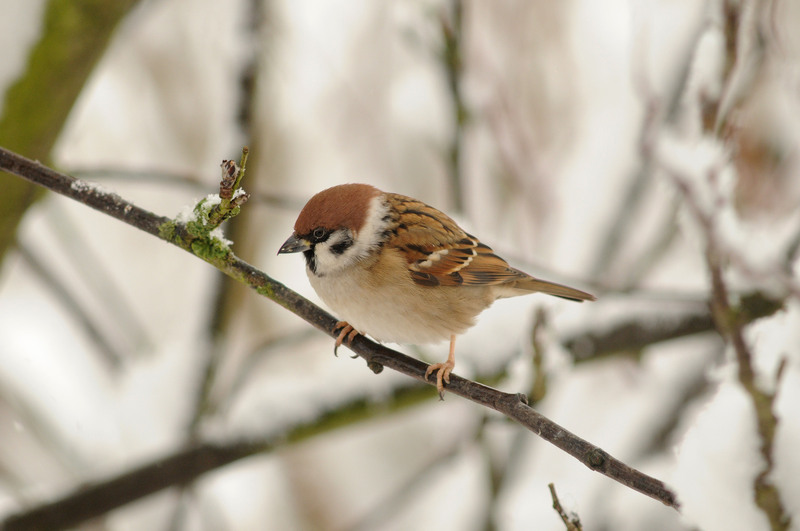 The European Commission have published an online consultation seeking the public’s view on a future EU initiative (known as ‘No net loss’) to halt biodiversity loss. Although the EU and its member states already have various conservation measures already in place, such as the designation of protected Natura 2000 areas, almost 25% of European animal species are thought to be at risk of extinction. Can we encourage readers to submit their views on the consultation here, biodiversity and a healthy environment are not an option but a necessity? Belatedly to draw to readers attention the ‘red carding’ of the “greenest government ever” . The Environmental Audit Committee recently published its findings Environmental Scorecard, and whilst one might be tempted to describe them as damming they will hardly come as a surprise to anyone active in conservation campaigning? The Government should set up an independent body—an ‘office for environmental responsibility’—to (i) review the Environment Strategy we advocate; (ii) advise Government on appropriate targets; (iii) advise Government on policies, both those in Government programmes and new ones that could be brought forward to support the environment; (iv) advise Government about the adequacy of the resources (in both central and local government) made available for delivering the Strategy; and (v) monitor and publish performance against the Strategy and its targets. Whilst these are to be applauded, we would wish to secure reasurance that the ‘independent body’ must be just that otherwise Government credibility is again, even more damaged? Any ‘independent body’ needs to be drawn, not from the usual suspects or party patronage, but from candidates with a proven track record and the confidence of rank and file activists. Posted in Executive Secretary | Comments Off on Conservation matters? “No net loss”? Whatever it is they [DMBC] know about the Danvm Drainage Commissioners, they don’t want to tell the public? Readers were reminded on Monday about our Freedom of Information request to Doncaster Metropolitan Borough Council about an Internal Audit undertaken on the Danvm Drainage Commissioners. 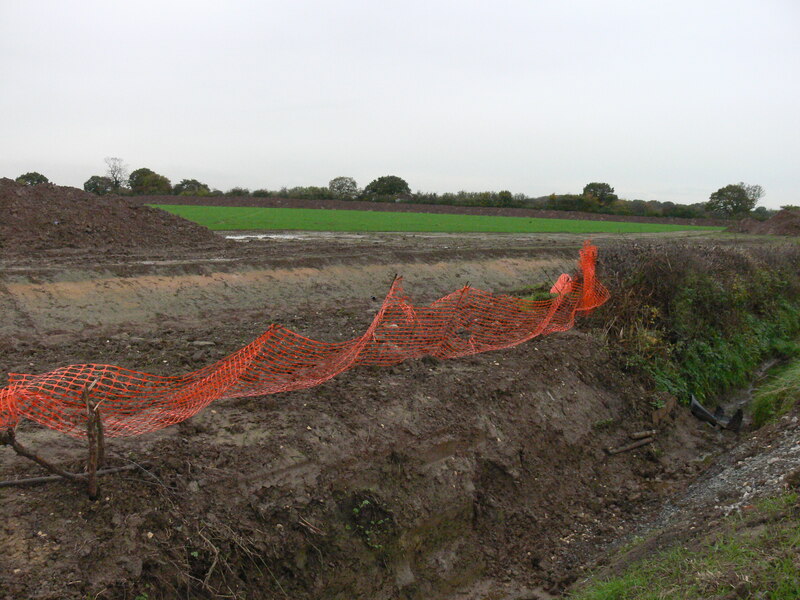 Fishlake Mining Subsidence Remediation Scheme: an example a project promoted by the Dun Drainage Commissioners and later their successors the Danvm DC. DMBC had failed to comply with its own procedures. Its own initial acknowledgement indicated a reply would be provided by 15 August, so five days overdue (or three if you accept the WhatDoTheyKnow website advice) and as there was no request for additional time we submitted a request for an Internal Review yesterday …. today we receive an email update and a response was provided. The FoI was made 19 July and it has taken until 20 August to “Refusal to Disclose Information” and then the reply describes it as the Danum Drainage Board. It is now Danvm (note the spelling, a Board decision and one which DMBC were a party to) and they are the Drainage Commissioners, minor points maybe but this kind of inspection and performance is surely about attention to detail? After carefully considering your request, the Council has decided to refuse to disclose the information you have asked for under Section 22 of the Freedom of Information Act 2000. This law allows us to refuse to disclose information through the Freedom of Information Act process which is “information intended for future publication”. This is called an “exemption”. Anyway, in short they are not prepared to release the information funded through the public purse until the Clerks to the DDC have seen it first. The local IDBs including the two ‘super-boards’ are serviced by the Shire-Group of IDBs. Read the rest of the letter via the WhatDoTheyKnow website here. Why they cannot also release it to enquirers on the same day is not clear, a sceptic might then be forgiven for thinking that perhaps then the Clerk and Administrator to the DDC will elect to apply their procedure and to take a further 20 days to provide it – this is open and transparent government? 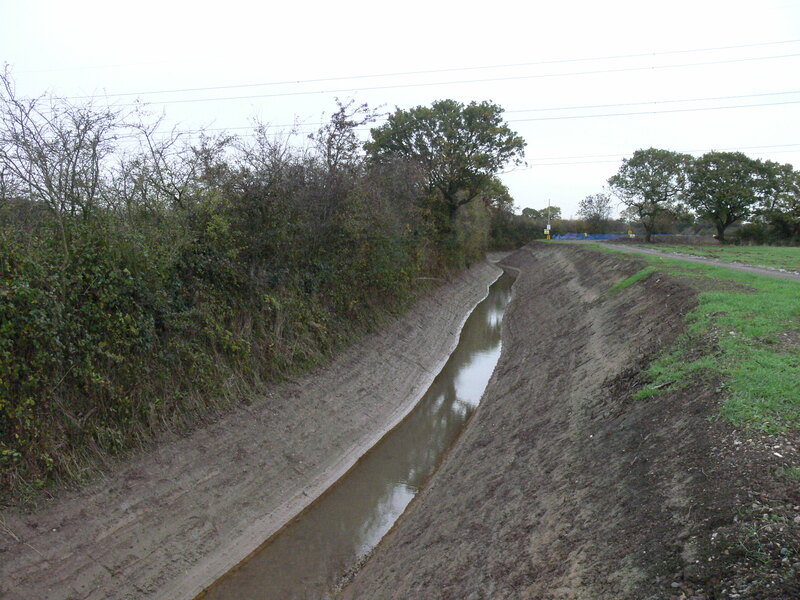 Internal Drainage Boards have come under increasing scrutiny in recent years, and some organisations involved in attempting to hold them to account would consider this to be long overdue. Many receive substantive amounts of public funding by way of Special Levy. It is only recently that all the Local Authority nominated appointees have begun to attend and take an active part in scrutinising the business and conduct of local IDBs. The Audit of Accounts 2010 – 2011 of the Caldicot and Wentlooge Levels IDB Report In the Public Interest makes quite astonishing reading …. is that of the Danvm Drainage Commissioners going to be a variation? What would, in our opinion, have been prudent ahead of the amalgamations of the smaller localised IDBs in the area would have been thorough audits and appraisals in the public interest, but for some reason there does not appear to be rigorous application of best practice governance in this area. If we revisit the analysis of the Defra encouraged amalgamations which created two large ‘super-boards’ in this area (Humberhead Levels) then we might be forgiven for asking why Defra the government agency responsible for Land Drainage did not require independent audit of each of the local boards as they were subsumed into the new arrangement? So, will this DDC Audit Report see the light of day, will it be made available to the public? Who will be found to be wanting? Will there be any action if there is found to be any ‘issue(s)’? Readers might recall the incident where a landowners lawful tenant caused damage to a SSSI on the periphery of Thorne Moors SSSI, neither the Rural Paymants Agency nor Natural England acted to either recover public funds or investigate the impact on the special feature of the SSSI. Austerity measures introduced across many public services and yet no recovery of public funds where there was clear breach of cross compliance &c.? Posted in Executive Secretary | Comments Off on Whatever it is they [DMBC] know about the Danvm Drainage Commissioners, they don’t want to tell the public? A recent enquiry has added the third record of a species to the Lincolnshire coleoptera list. 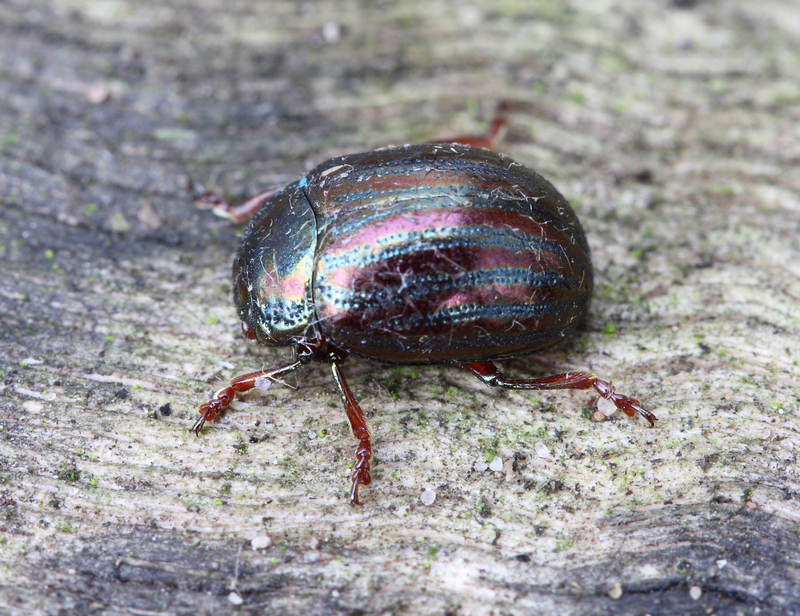 This Rosemary beetle Chrysolina americana was located in a sub-urban garden in the Humberhead Levels. 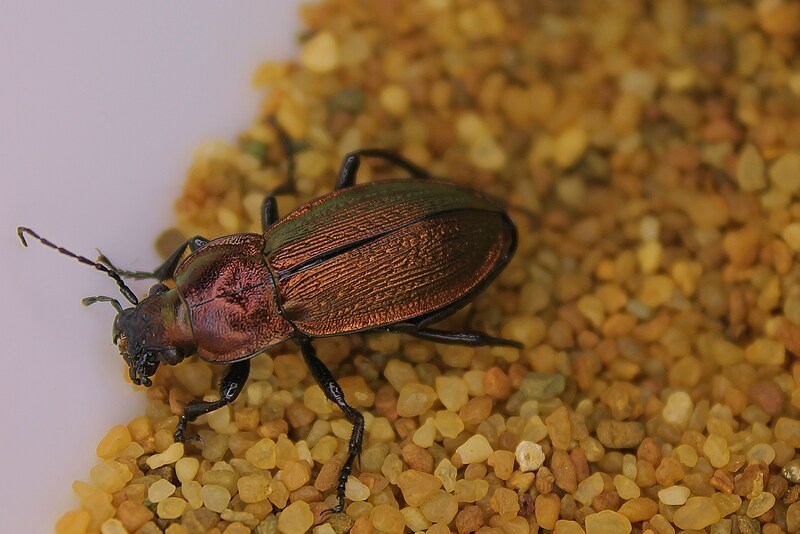 Chrysolina americana has established itself in the UK. It appears to have been first recorded in 1963 (Johnson) in Cheshire and was considered to have been a possible introduction from Portugal where it is common. It has attracted the attention of the Central Science Laboratory who have written a Pest Risk Analysis for the species. It provides a useful insight into occurrence and likely mode of arrival in the UK. The Royal Horticultural Society also provides detail. They overwinter in leaf litter below the foodplant (rosemary and thyme). They have also been recorded as being active during the winter months, which is interesting considering they originate from the mediterranean! It just goes to show that it pays to keep your eyes peeled for interesting invertebrates even in winter! 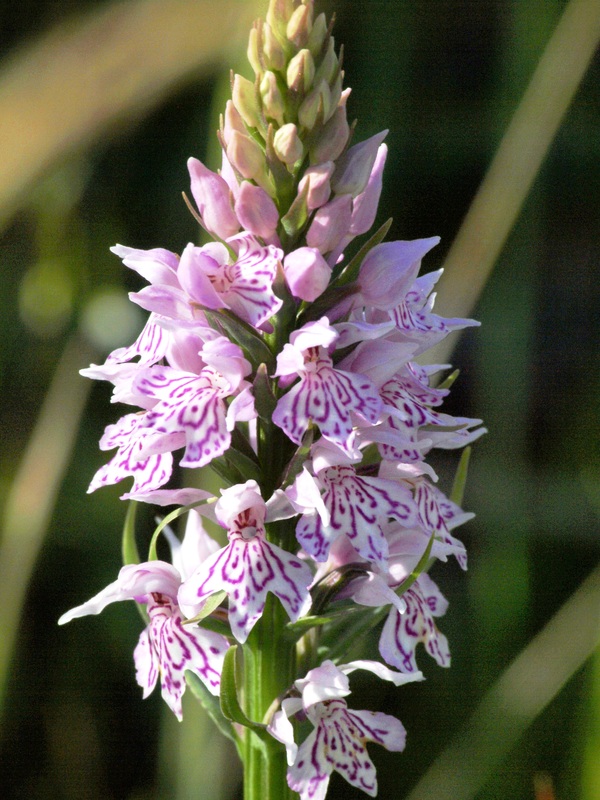 Let us know if you find one in your garden …. Thanks to Ted Sabin for providing the image. Challenges & opportunities, which is fracking? Happy New Year to all and let’s hope it’s a good year for the natural environment …. The year started well enough here, two kestrels on my metaphoric doorstep or backyard if you prefer. I was reminded of a piece on a news programme that reported Kestrels in decline and appealed to people to submit sightings, so if one of your new year resolutions is to submit data to recording schemes, then look here at the Hawk Conserevancy Trust’s Kestrel Count and make your observation count? I tried but experienced ‘technical issues’, hopefully other readers will do better? Add to that Great Spotted Woodpecker at the nuts and home-made bird cake, a pair of House Sparrows amongst the eight or so Tree Sparrows. Up to c.20 Goldfinch, smaller numbers of Chaffinch and just a pair of Greenfinch but no sign yet of any of the ‘winter finches’ i.e. Brambling or Siskin yet. Otherwise the usual two dozen or so species for a rural garden with the resident pair of Moorhen becoming braver with the advent of colder weather but no sign of the Weasel which graced us with its antics on Boxing Day! Wonder if the Tawny Owl is vocal again tonight? So, challenges and opportunities …. which is fracking, or is it both? I suppose much depends on which side of the fence you sit, or perhaps you’ve not yet decided which side you’re likely to fall off the fence into …. I don’t propose to try to explain the details of the process, nor the risks or benefits as there are many far more authoratative sites able to do that. As yet, the Forum have still to analyse the risks to the environment and form a view, so to date we are still adopting an agnostic approach. Is there any independant science out there? Or is it all funded through industry think tanks etc.? What I am doing is simply sharing with readers snippets I’ve discovered which may have the potential to impact on our lives in our bits of the Humberhead Levels. What we’d appreciate is any reader coming across interesting or useful material to pass details across to us. The Department of Energy & Climate Change (DECC) have just issued a press release “Next steps for shale gas production”, further to that I’d strongly recommend that readers respond to the DECC consultation. Interestingly the same webpage does not offer a direct link to that consultation, but if you look in the Notes to Editors and then try The Strategic Environmental Assessment, voila! You have until 11:45pm on 28 March 2014, so go on make a start now! Let’s begin to make the critical mass of conservation heard in the corridors of Government …. Cash for communities impacted by operations? The National Trust have issued a statement on fracking, for more detail see here. However, The Telegraph reports changes to a government-commissioned report to more accurately reflect the negative aspects. The Guardian reports a number of stories, see here. Who can we trust in such matters? Green Party MP, Caroline Lucas was recently charged over the right to peaceful protest, now how’s that’s for a principled stance? Posted in Executive Secretary | Comments Off on Challenges & opportunities, which is fracking? Season’s greetings to all & random ramblings …. As I travelled about earlier today the winds building up were quite noticeable. The winter plover flocks were buffeted by them, the finch flocks foraging in the few fields still offering stubble were carried further by them whilst the thrushes struggled to find hedgerows amidst the local prairescape. Later on the news reported in excess of 100 flood warnings and around 160 flood alerts across the country, power failures are also reported so it looks like it could be a cold and wet festive season for many. Here in the Humberhead Levels, of which much is flood plain, we seem to escape the worst of the ravages that places like York experience. If we head a little further north into the Lower Derwent Valley, where the rivers flood regularly it really can be a picture to behold. The farming practice however is well used to these occurences and manage the cropping regime accordingly. 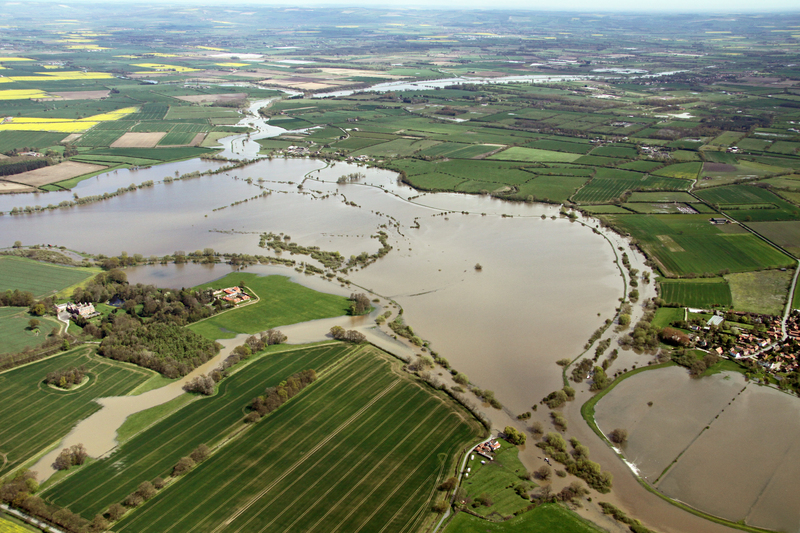 A spectacular aerial view across Wheldrake Ings in the Spring of 2012. The turmoil suffered by many is tragic, but the fact that Government insist that local authorities build 20% of new housing in flood plains fails to make any sense to me, clearly a difficult policy to understand? Government and its statutory agencies and authorities have often conducted business which appears to contradict their published aims and objectives. Science seems to have been abandoned when our natural environment is under threat, instead developers are ‘advised’ or encouraged to mitigate for loss. I suppose the resultant column inches from such gardening projects makes for nice political PR? Guardians no longer seem able or willing to risk political displeasure by ensuring strict adherence to relevant legislation. Thankfully though I’m not a lone voice, other well read bloggers such as Mark Avery whose excellent Standing up for Nature blog seeks to encourage, to motivate and to provoke, Miles King’s a new nature blog is another thought provoking example. These and others have and sadly continue to report horrendous shortfalls in action to halt decline of species and habitats. ‘Twitcher in the swamp’ and ‘Naturally opinionated’ are both regular pieces in British Wildlife and they too are well worth the read. I recall the 1997 masterpiece: “A muzzled watchdog” I sense there is an opportunity for a revised edition given the many and varied reports published by collaborations of NGOs, which read like obituaries rather than government marketing spin. The conference at which the bold State of Nature report was launched brought the prospect of hope? Nature Check 2013 and others followed, as Iolo said words …. I’m an agnostic, so await their update but fear that it will be variation. Activism is what’s needed, so who will call conservation to arms? Will Andrew Sells herald a new beginning for nature’s guardians, Owen Paterson introduces the Government’s preferred candidate …. but it seems George Monbiot is not too sure, nor is Miles King. Ever our agnostic approach, we will observe evolution in action. A plea that if you’ve not already done so, to consider signing the petition STOP & RETHINK & just to re-iterate (again) that we’re NOT oppossed to the principle of open access, simply that we seek open and transparent process which adheres to legislation. Spare a thought tomorrow when you ‘pull the wishbone’ with family and friends, what do we all really need? Fundamental to human well being is surely a healthy planet, a functioning ecosytem (not a fractured one, fixed with financial ‘fiddling’) in which we play a part, albeit a major part. So, here’s wishing all our readers a happy and healthy Christmas and on the morrow a determination to promote, to encourage, to persuade, to advocate, whatever it takes to repair decades of damage to sensitive and fragile habitats. So, a big thank you to all the Forum’s volunteers and to our extensive network for the help and support provided throughout 2013, particularly to the many ecologists who have made significant contributions to our understanding of the biodiversity of Thorne and Hatfield Moors SSSI. Here’s to 2014 and to ‘moor’ firsts for the UK! Moody and evocative, therapeutic and energising – all these emotions are out there so please join us in seeking to champion the cause for nature conservation wherever you live! 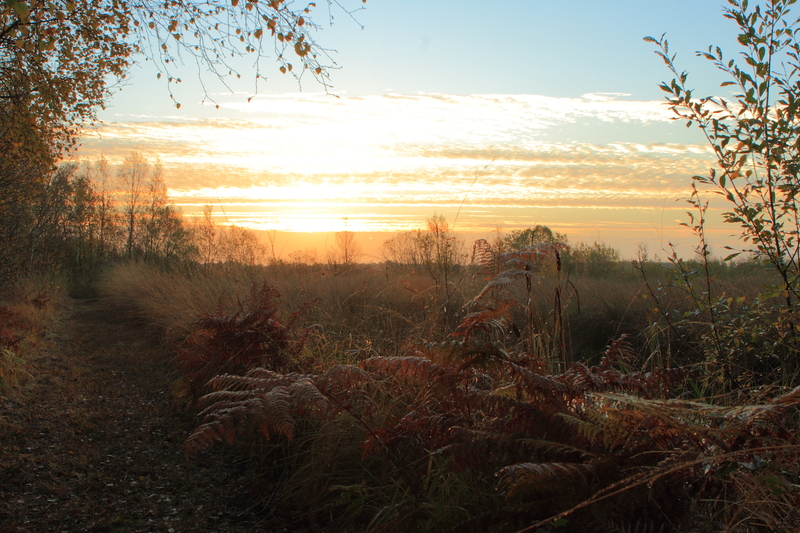 Thanks to Ted Sabin for sharing this autumnal image of Crowle Moors. Posted in Executive Secretary | Comments Off on Season’s greetings to all & random ramblings …. Democracy, accountability and Internal Drainage Boards …. For over three hours this morning ‘democracy in action’ was observed. The Danvm Drainage Commissioners held their annual meeting. The public contribution in terms of funding this board’s operation is around 87%, but …. elected members have 12 seats and local authority appointments 13. Quite a few of the nominated council representatives were missing despite the significance of the meeting. The chair was appointed from the elected members and the vice chair is a Selby councillor. It is astonishing to witness the conduct of business, people can nominate themselves and they can vote for themselves! Only recently have conflicts of interest been recognised and members do now occasionally ‘declare an interest’ however they very rarely explain what that amounts to. 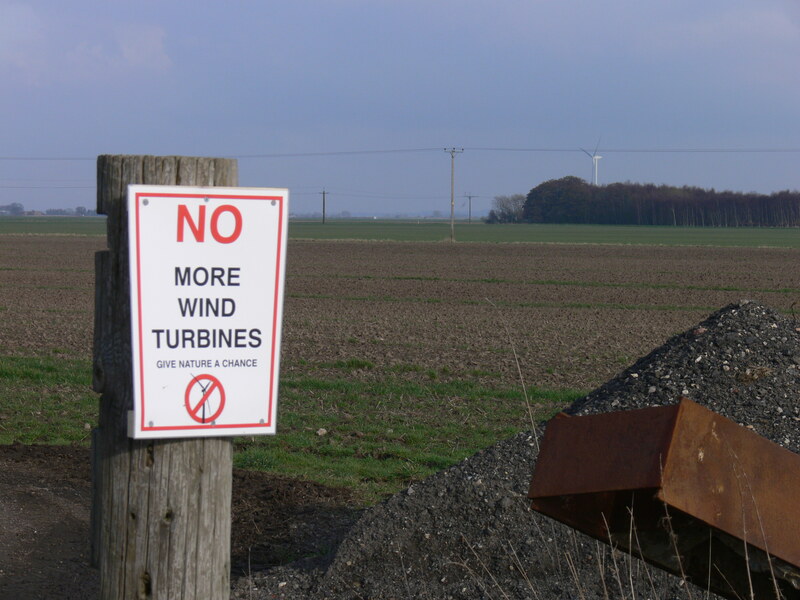 Today witnessed a worrying lack of understanding of legaslative requirements and a reluctance by some to comply with them particularly the environmental regulations. The Danvm Drainage Commissioners like other local boards operating in the Humberhead Levels has been the subject of amalgamation (four smaller boards into a single one). Representatives from the four local authorities of Doncaster, Selby, Barnsley and Wakefield attend. Other members include individuals from the agri-industry sector and as large landowners beneficiaries from the pump drainage of the low lying lands in the district. Numerous governments in recent times have sought to modernise these archaic institutions and whose rules by which they operate seem steeped in feudal and manorial history and tradition. It is only in the last year or so that the minutes of some of the meetings have been made available. Previously special arrangements had to be made to inspect documents in IDB offices which was not always easy. On a positive note, the public are also now allowed to observe proceedings. There were three members of the public at the DDC meeting, so here’s to more people taking a close interest in the activities of such Public Bodies. Ahead of the normal business members were treated to a presentation by the Deputy Director of Doncaster MBCs Legal Services. He explained that whilst he had not investigated the complaints made against the DDC in detail he did consider them to have some substance particularly in terms of board governance and quality of decisions. In terms of effective governance it seemed that there might have been a situation where accusations of ultra vires had been levelled and this had yet to be resolved? The officer took the members present through the Nolan Principles as they are the rules by which Public Bodies are expected to operate. Members were also reminded of the outcome of investigations into the Caldicot and Wentloodge Levels IDB (audit of accounts 2010-11). An astonishing state of affairs and almost unbelivable in the 21st Century? See the BBC reporting of proceedings here via Democracy Live. We understand that the C&WLIDB is no more, instead its functions and responsibilities have been transferred to Natural Resources Wales. Has the time come for a variation to be conducted across the English boards? 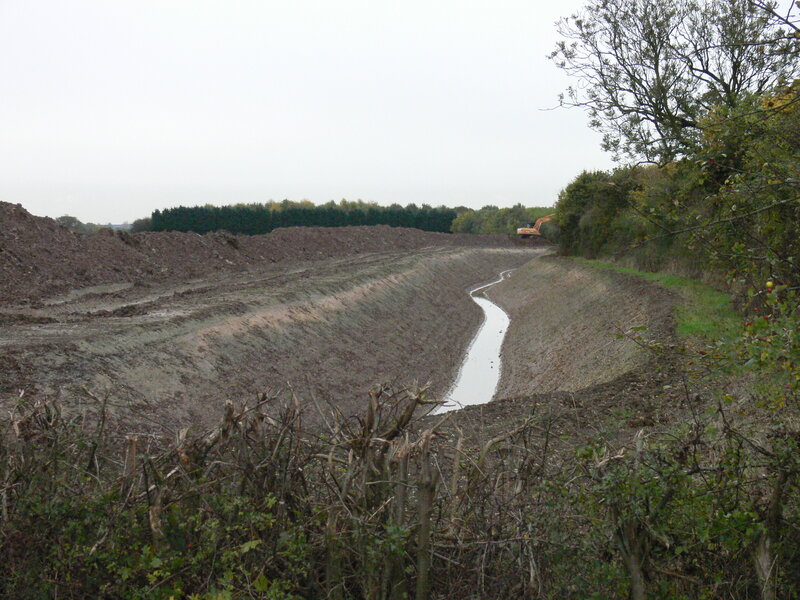 It is clear that the land owners around the Humberhead Levels favour regular heavy maintenance of the smaller dikes to prevent local ponding or standing water whilst the local authorities and coal board representatives have concerns about flood allieviation and the protection of property function. With limited income there has to be prioritisation and a balance between people, flood risk and farmland has to be achieved particularly as the public through the taxation system are by far the largest contributor. Transparency in the public interest and open conduct of business unless good reason was called for was sought by the legal services officer. A review of the complaints system, production of policies oustanding or missing should be undertaken. There has been a degree of ‘modernisation’ over the last year or so but there is still a way to go. The other IDBs who operate in the Humberhead Levels and who the Forum observe the operations of are Black Drain (a small group retaining independence and not having amalgamated), the Doncaster East IDB (another relatively recent amalgamation of six smaller boards), Goole Fields and Reedness and Swinefleet IDBs. Tween Bridge and Hatfield Chase board areas abut the peat bodies of Thorne & Hatfield Moors SSSI and their operations have the potential to impact upon the integrity of the Natura 2000 sites and these two boards were amalgamated into the Doncaster East IDB. DDC are the supporting drainage board for the Fishlake Mining Subsidence Remediation Scheme which is now being implemented, the images shown illustrate the major engineering works currently being undertaken. This scheme (previously reported in earlier posts) initially sought to remove nearly 1 km of ancient hedgerow and a number of mature trees. Neither the Environment Agency nor Natural England objected to that substantive loss of biodiversity. However the Inspector found that the Forum’s argument had merit and we understand only 150m is now scheduled to be removed …. 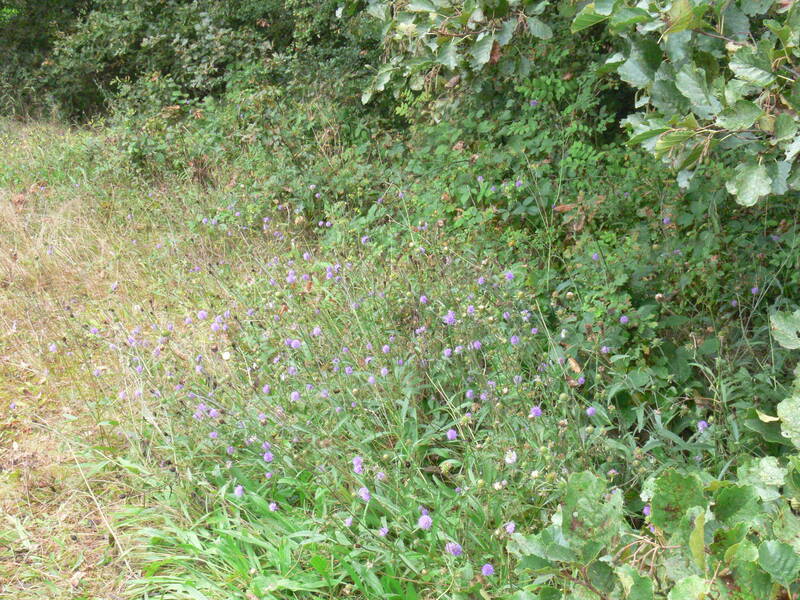 A length of new drain cut alongside a biodiversity rich hedgerow and in an area of Fishlake known to support populations of rare and uncommon plants. Despite assurances that drains would be engineered in such a way to benefit wildlife, these clearly followed the tradition of deep, steep with no shelf. ADA and NE collaborated to produce The Drainage Channel Biodiversity Manual, (2008) but there seems no evidence of take up in the Fishlake drainage board area despite the area being flagged as an important biodiversity and landscape area by DMBC. Another documents which assists understanding in terms of biodiversity duties include Guidance for Public Authorities on Implementing the Biodiversity Duty. (2007) Another succinct resume of duty has been produced by the Water Management Alliance and IDB members would do well to read the two page summary Nature Conservation Responsibilities of Internal Drainage Boards. IDBs derive their powers from the Land Drainage Act 1991 (as amended 1994) and where is clear in that it requires IDBs to “further the conservation” …. and this applies to land immaterial of any conservation designation attached to it. It is unclear why hedgerow has been removed from this stretch alongside the road. The new drain can be seen at the back and the layer of sand with clay beneath is clearly visible. As energy costs rise substantially the pumped drainage of this low lying area will become increasingly expensive (an estimate of 15% was mentioned at the meeting) then tax payers through the local authority representatives might begin to question who should receive the benefit. Clearly there is a responsibility in regard of flood alleviation and protection of property but should agriculture receive additional funds through ‘subsidised’ drainage where there is no demonstrable public benefit? Black Drain and Doncaster East IDBs are both scheduled to hold meetings next week, so …. watch this space? Posted in Executive Secretary | Comments Off on Democracy, accountability and Internal Drainage Boards …. Observations of late lepidoptera on the Humberhead Levels. Recent autumnal weather has been such that it has seen Red Admiral, Speckled Wood and Small Tortoiseshell butterflies enjoying the last of the nectar available to them and this supplemented with fallen fermenting apples and juice from blackberries. 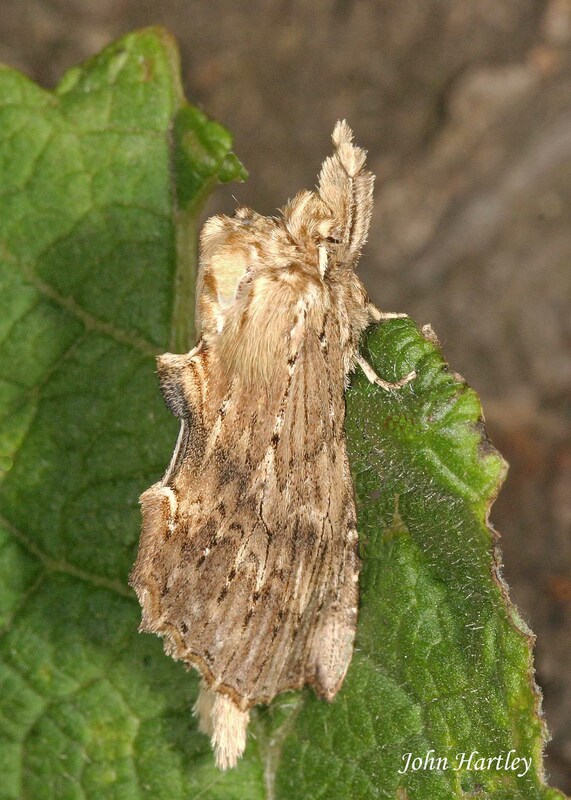 Nettle-tap moths too have been observed feeding on ivy flowers. I’ve been doing a little more investigation into the occurence of Dryobotodes eremita Brindled Green since my last post. 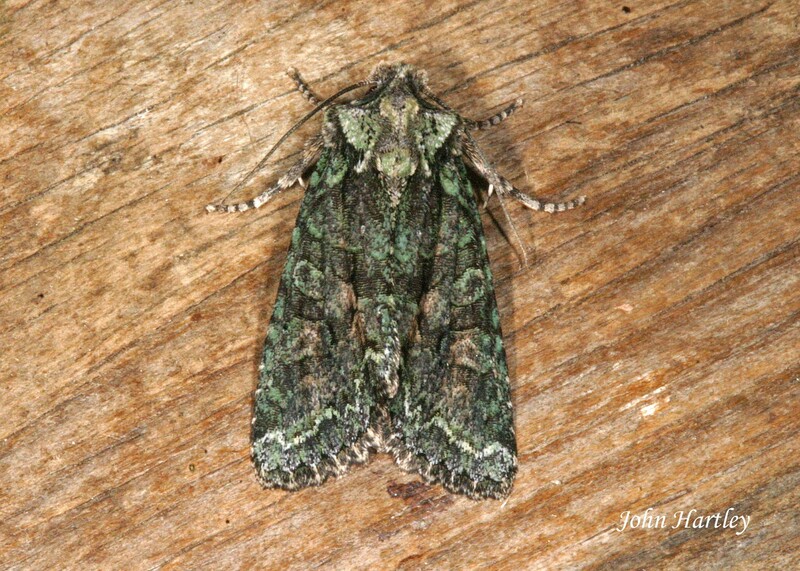 One correspondent reminded me that I was at a moth night on Hatfield Moors in September 2011 when 2 came to light, so effectively these were the first for Hatfield Moors, if Skidmore (2006) accurately records previous observations. 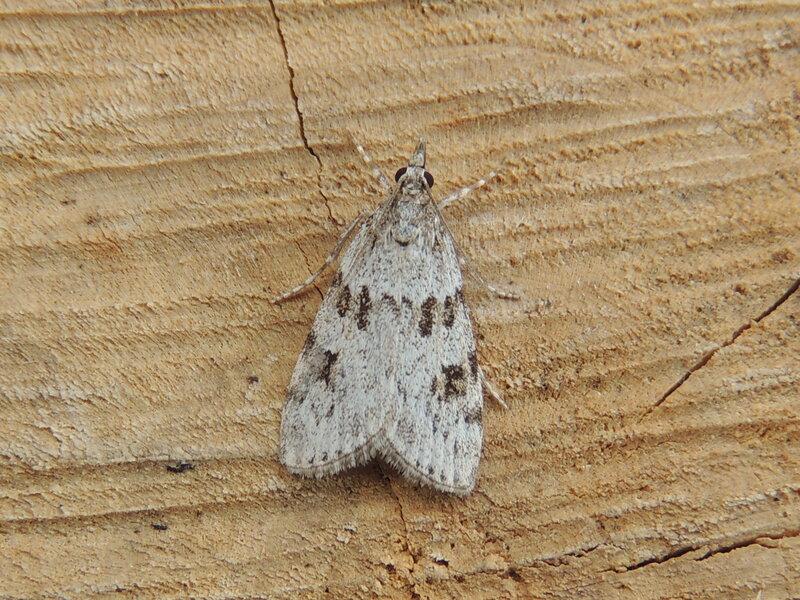 The species was known from Thorne Moors in 1962, unless anyone else can update any later dates? Thanks also to John for sharing his images which feature in tonight’s post. If you compare them with the specimen shown on 20 September post, they illustrate well the variation in ground colouring of the species which can occur. Interestingly the two specimens shown here are from the same area. Reminiscent of relatively recent occasions when I have observed two and three colour variations of Peppered Moth at the same site, the black, white and an intermediate. That above shows a brown ‘background’ colour, below shows a green base. Interestingly these specimens are Humberhead Level ones, suggesting that the species is another under recorded one. The stunning image below, illustrates another uncommon species to Yorkshire, although it is recorded more frequently in Lincolnshire. Again the specimen is a Humberhead Levels record so ‘eligible’ for inclusion on the blog and thanks to Phil Lee for submitting it. 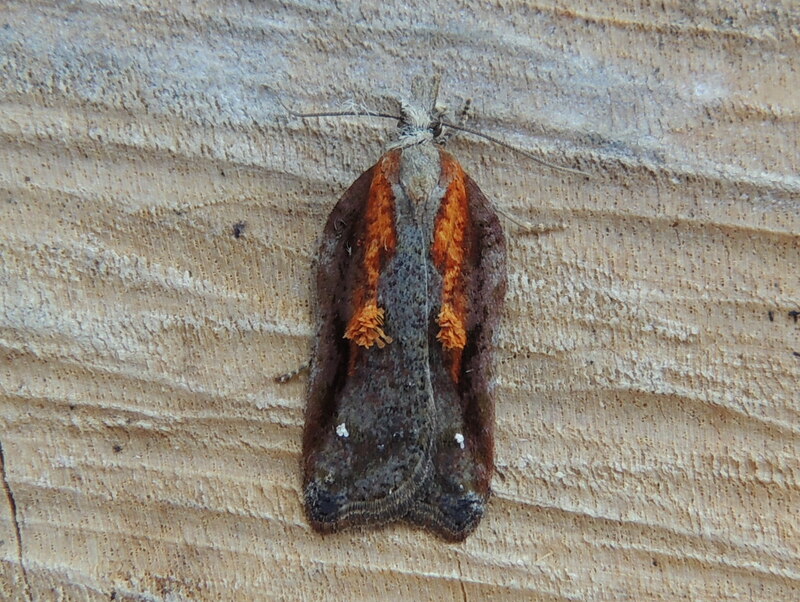 Acleris cristana is a delightful little moth, it is another species which is variable in colouration but the forewing hair tufts, clearly visible in the image below and they are the give away and clinch the identification. 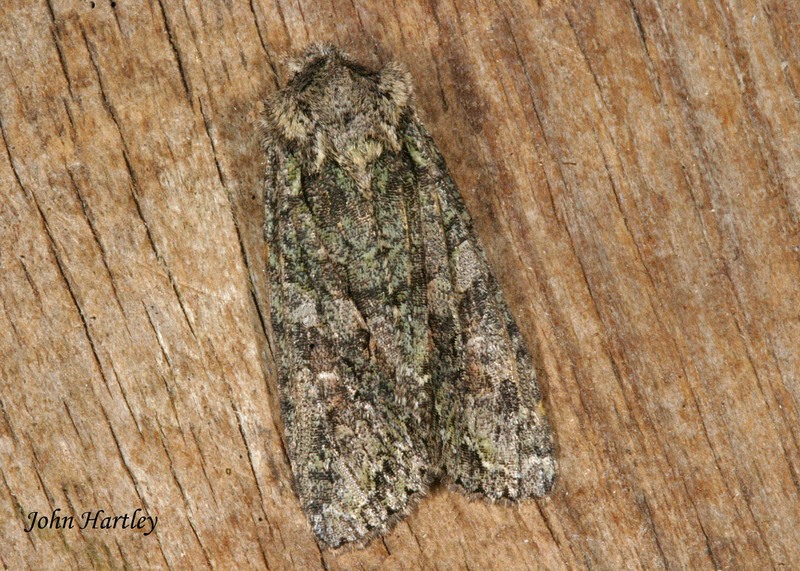 Described on the UK Moths website as a scarce but distinctive tortricid, occuring mainly in southern England. Another record subsequent to determined effort, keep them coming! Click on the images to enlarge them and see the detail referred to in the text of the post. Images by John Hartley & Phil Lee. Posted in Executive Secretary | Comments Off on Observations of late lepidoptera on the Humberhead Levels. 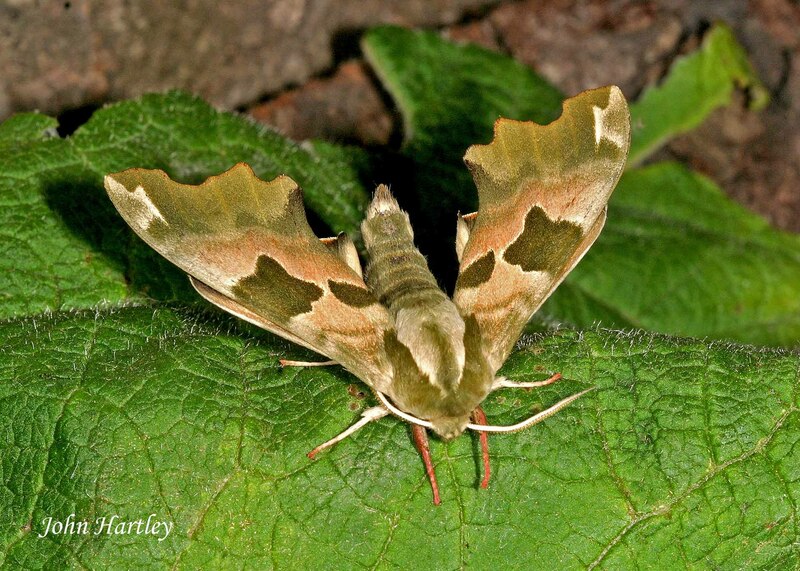 How many people (in the Humberhead Levels) can boast a garden moth list which has seven species of hawk-moth, so far this season? Well, one contributor to the blog can and these latest images illustrate his most recent ‘tick’. 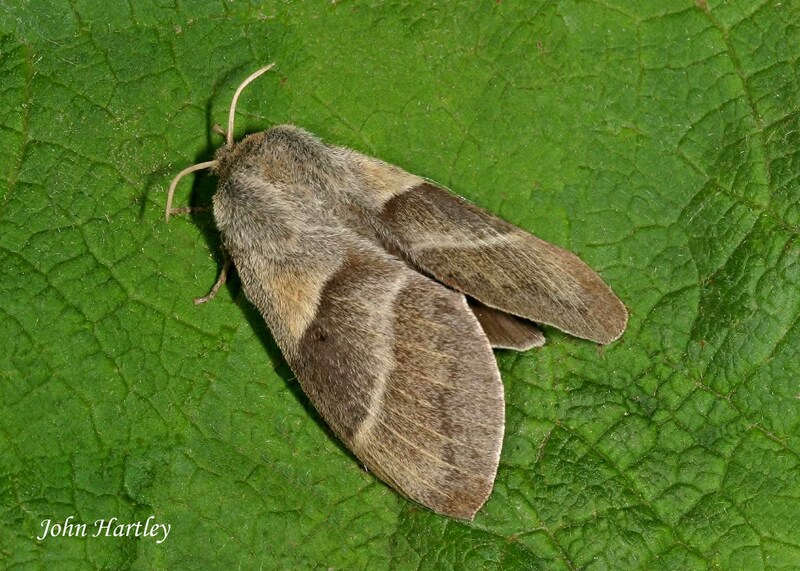 Sphinx ligustri (L.) or named for one of its food plants, the Privet Hawk-moth (above) can be recorded in June and July. It is also recorded from young woodland Ash saplings, lilac and guelder rose and occasionally holly and honeysuckle. Overwintering underground as a pupa, sometimes to a depth of a foot or more! 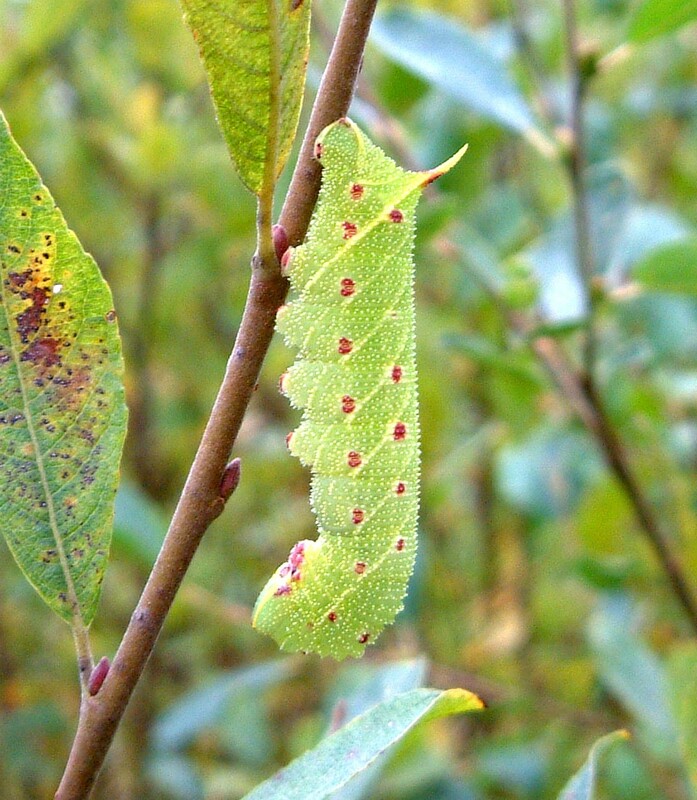 The larval image at the top of this post, illustrates the quite stunning colouration and the distinctive ‘horn’ characteristic of hawk-moths. 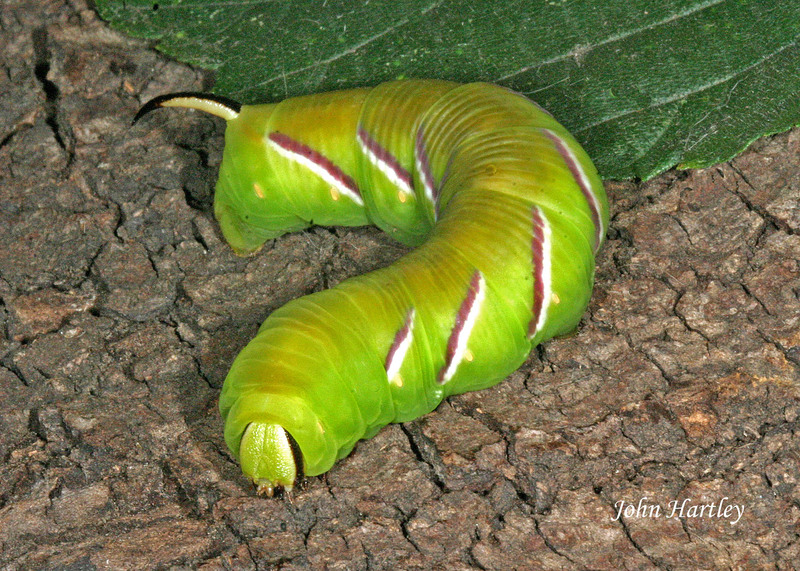 Mimas tiliae (L.), another species named for its food plant is the Lime Hawk-moth illustrated below. 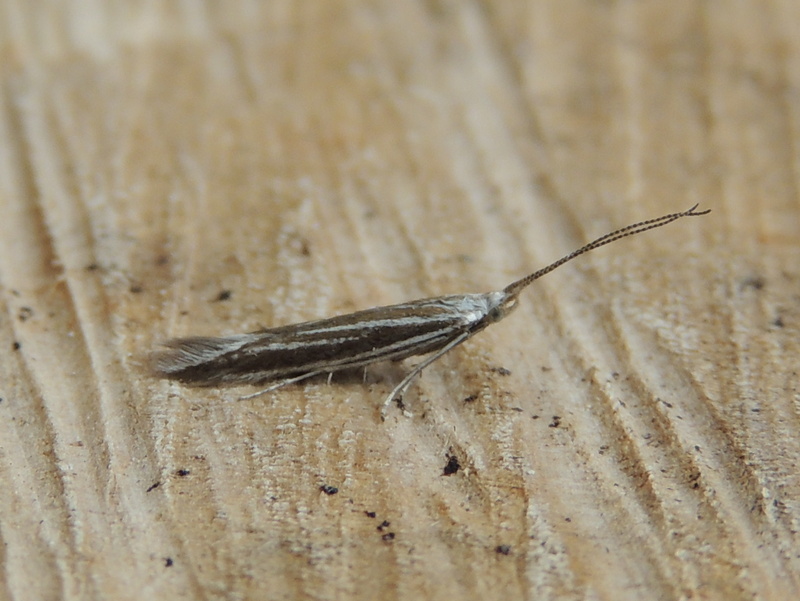 This species, a smaller one to the previous ‘giant’, is recorded from May to early July and larval food plants also include elms, downy and silver birch and alder. The final image, is that of Laothoe populi (L.), Poplar Hawkmoth another relatively common species recorded locally. This larvae illustrated here is about to pupate after which it will drop to the ground to overwinter, note the orientation by the ‘horn’. Generally single brooded flying from May to July or early August. The British list contains some 26 species as having occurred in the UK (some of which are vagrants or adventives), so to get seven in a garden in a single season is, I offer, pretty good! Factor in that that Skidmore (2006) listed eight species recorded from the Humberhead Levels (including one historic record), so that makes the local garden season an excellent vintage – can anyone better that? Let me know, the only eligibility is the requirement that the data is from a Humberhead Levels garden, or other ‘regular patch’ …. An excellent resource for aspiring lepidopterists is Butterfly Conservation’s website of the Moths Count project. Although the project has concluded the website still offers useful advice for anyone wishing to further their interest in lepidoptera. The legacy of the HLF funded project was the mammoth undertaking which delivered the Provisional Atlas of the UK’s Larger Moths (2010). Other useful publications include “the state of britain’s larger moths” (2006) and the more recent edition of “The State of Britain’s Larger Moths 2013”. 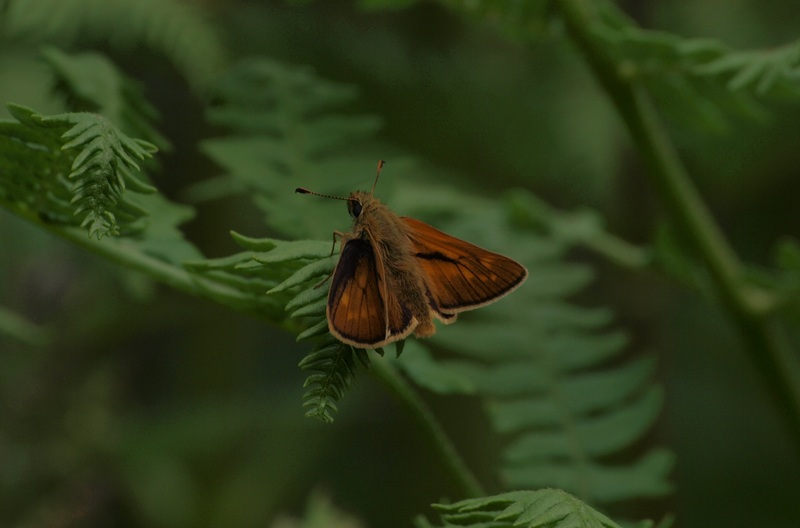 Butterfly Conservation are encouraging membership and are offering half price membership to anyone signing up by direct debit before 31 October 2013 (if you join after reading this, then please let them know it was through this blog). BC make available a great deal of useful material, much of which is designed to encourage newcomers to the delights of lepidoptera and despite its name it also takes a very active interest in the moths! Before anyone contacts me to tell me that the offer is out of date, quote MC5013 as that offer is until 31.10.13 and detailed in the Moths Count Newsletter 2013 I received a while back. Images by John Hartley & Peter Kendall. Posted in Executive Secretary | Comments Off on Moth matters …. 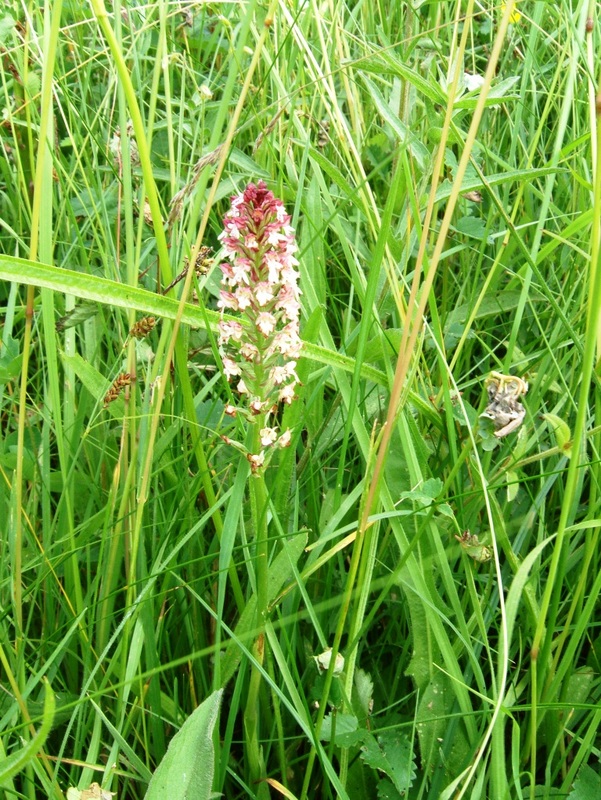 Species rich haymeadows – a thing of the past, a declining habitat? Rarely do we hear such eloquent music plead for the environment as has recently been sung by the ‘Welsh bard’ Iolo Williams and posted on u-Tube following his appearance at the launch of the State of Nature launch. I don’t know who uploaded the film but a big thank you! It has had an incredible number of viewers and comments and I’d certainly recommend watching or just listening to the clarity of purpose resonating in his voice, music to campaigners ears. A call to arms. Iolo rightly points out that the failure thus far is a disgrace. One could be forgiven for wondering what ever happened to the much heralded 2010 “Making Space for Nature” Report? Where are all the promised improvements? Conversely, in an open and refreshingly honest way The State of Nature Report certainly appears to evidence ever diminishing space that is left for nature, it is a catalogue of decline of habitats and species. He’d get my vote to to organise a ‘cull’ of inefficiencies and surplus fat cats more bothered about their pensions than the legacy for our grandchildren. His merciless lambasting of the politicians and the inactivity of organisations who have failed to stem the tide is sheer music. He certainly didn’t mince his words with his interpretation of the new name given to the organisation which is pedalled as being the agency which will be looking after the countryside in Wales. Honesty – absolutely wonderful, delightfully refreshing! The self confessed unashamedly proud Welshman laments the loss of haymeadows and moors and being of that same era I too can recount similar losses here in the Humberhead Levels and across the wider Yorkshire. There have been campaigners fight to conserve our precious countryside, the likes of the late Wm Bunting and the late Stephen Warburton but they are sadly no longer amongst our number and the natural regeneration is in decline. Real campaigning conservationists are also a rare species now, these days it seems that too many are happy to take mitigation crumbs and ‘build biodiversity’ instead of conserving it. Haymeadows with their luxuriant hedgerows – yes I’ve seen them disappear and what precious few are left here in South Yorkshire and the Humberhead Levels we’ve had to fight for, the image above is evidence of a small success. 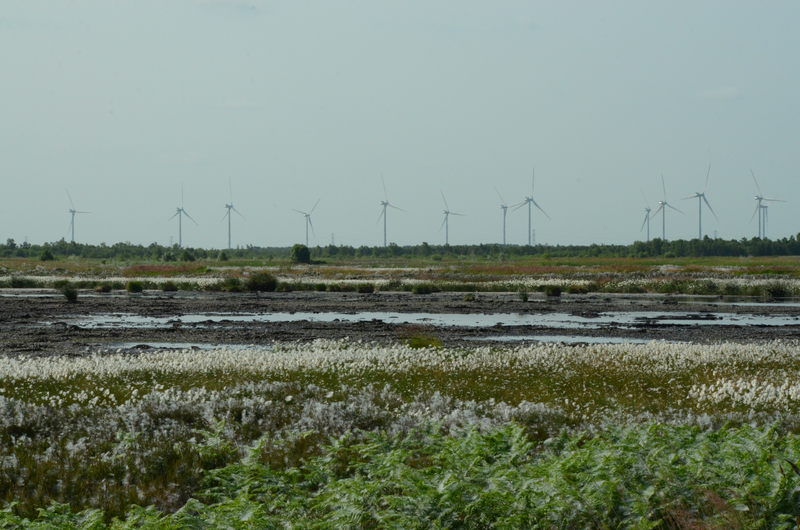 Then take the ‘battle for the bogs’ or lowland raised mires to give them their correct name at Thorne and Hatfield Moors are another example of beleagured habitats abandoned by those charged with statutory responsibilities for their conservation. Instead it’s been down to local communities to challenge, and like Iolo I wonder where the next generation are and what they will be left with consequential of the continual erosion and degradation of our natural environment. Thank you Iolo for the timely clarion call reminding us of so many things that we should be doing …. Well said cariad bach as my Grandfather used to say, and thank you too from a Yorkshire lass! Posted in Executive Secretary | Comments Off on Iolo for PM? Whilst not of the peatlands per se, the images show three species recently observed in the northern aspect of the Humberhead Levels. 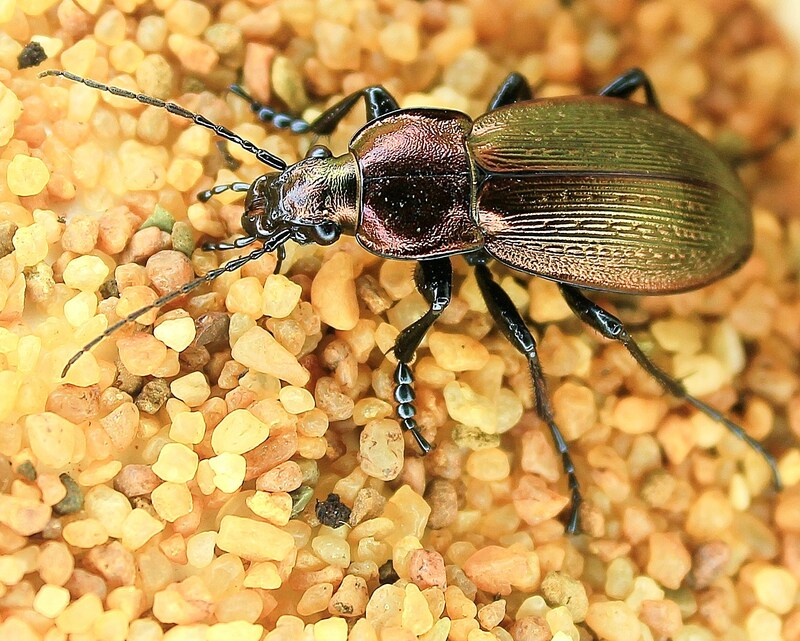 The wonderfully iridescent Necklace Ground Beetle Carabus monilis shown below is an aberrant specimen, compare the elytral markings on the two images (click on the images to enlarge). The second image of the same species illustrates perfectly the metallic hue of the species as well as the indicative rows of granules seperated by three regular and equal-sized ridges on the elytra. 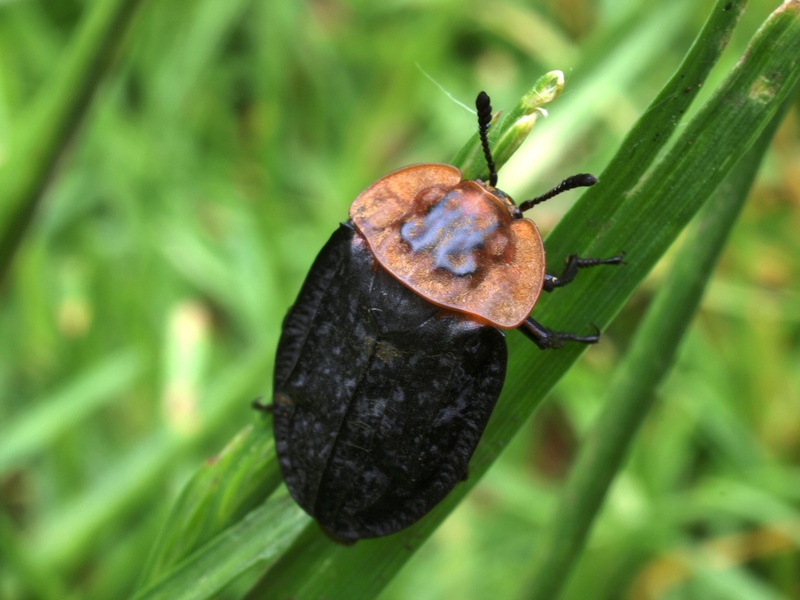 The beetle is a UK BAP Priority Species which JNCC consider to have declined due to the widespread use of pesticides, the shift from spring to autumn cultivation and habitat fragmentation may all have contributed to the species decline. 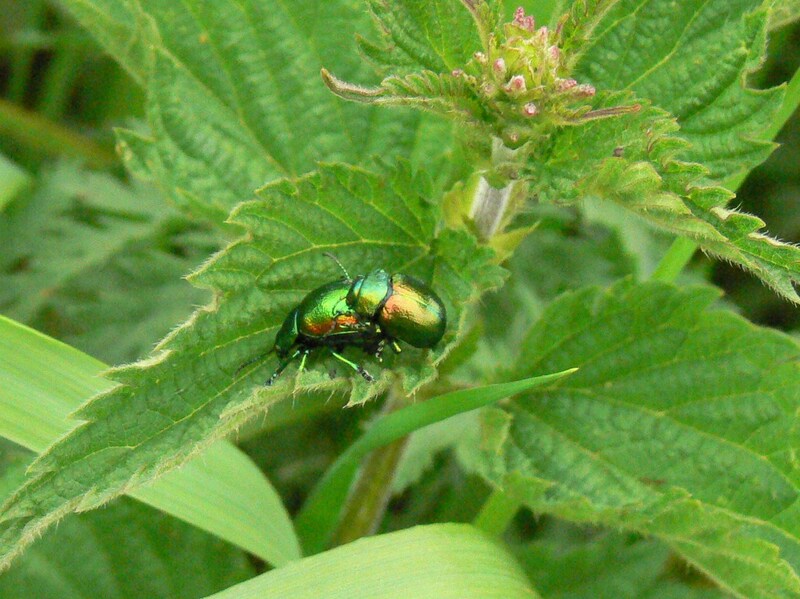 The much studied Chrysolina graminis or Tansy Beetle (below) aka the ‘Jewel of York’, featured here on the ubiquitous nettle is a delightful species whose ecology is not particularly well understood. It’s ecological requirements have yet to be fully understood in order to secure its future. It retains a precarious foothold along the Ouse floodplain where there are stands of Tansy alongside the riverbank and in old unimproved grasslands. Fortunately it is the subject of a long term and on going study and it can breed well in captivity. This aptly named Rhinocerus Beetle Sinadendron cylindricus was found in deadwood. Images Martin Hammond & Helen Kirk.